Recipe by Ina Low. Shared with permission. Place honey, sugar and Copha in a medium-sized saucepan and heat, stirring gently until it is melted and bubbling. Remove from heat and allow to cool slightly, then pour into a heat-resistant bowl. Sift flour, cocoa and Lebkuchen spice together. Stir half of the flour mixture into the honey mixture using and electric hand mixer on its heavy setting. Mix in the egg. Dissolve the Potasche separately in 1 tbsp water and then mix into the dough until incorporated. Then stir in the rest of the flour mixture, bit by bit. When it starts to become dry, turn the dough out onto a floured work surface and knead a few times until it has a smooth appearance. The dough should be nice and warm and easy to knead. Shape into a flat disc, cover with cling wrap and rest in the fridge for an hour or so. The dough con be made in advance and stored in the fridge for up to two weeks before baking. Allow dough to come to room temperature then cut off a small piece. Prepare the work surface and rolling pin with flour, the evenly roll out the dough to about 5 to 10 mm thick. Cut out desired shapes using cookie cutters or create desired shapes using paper templates that you lay on top of the dough and cut around with a small sharp knife. 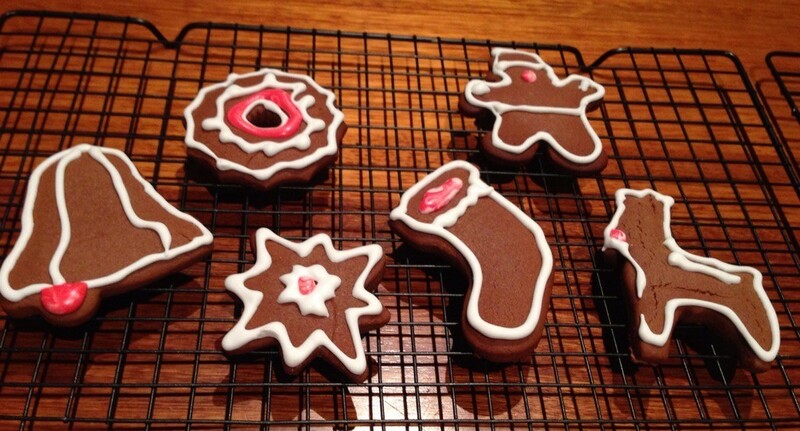 If you wish to hang the Lebkuchen, punch a small hole at the top with a drinking straw. Place on a baking tray lined with baking paper and bake in the over for 10 to 12 minutes at 180°C. Be careful not to burn the edges. Prepare the icing: put the egg white into a mixing bowl and beat with electric mixer until soft peaks form. Then start adding icing sugar gradually, spoon by spoon. Keep beating until stiff peaks form. Add food colouring, if desired. Fill a snap-lock bag with the icing mixture and snip the corner to make a piping bag. Pipe the icing onto the cooled Lebkuchen. 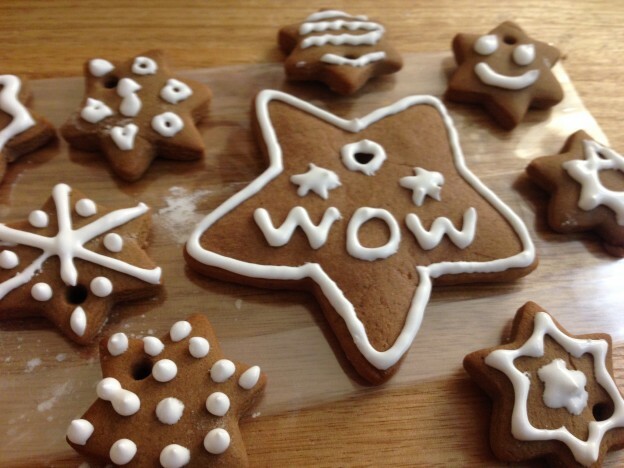 Lebkuchen spice contains cassia, coriander, star anise and ginger. Potasche (potassium carbonate) is a baking aid used in some German baking recipes, especially Lebkuchen. When mixed with water it reacts to create carbon dioxide, which gives lift to baked goods. Sodium bicarbonate (baking soda) can be substituted at half quantity, but the taste may differ slightly.